Collective punishment continues in Ofer prison. On 23 January 2019, Addameer’s lawyer visited few prisoners from Ofer, though the lawyer was not allowed to visit any prisoner from sections 11 and 15, according to Israeli Prison Services (IPS) those two sections are punished with a total closure and are banned from visits. 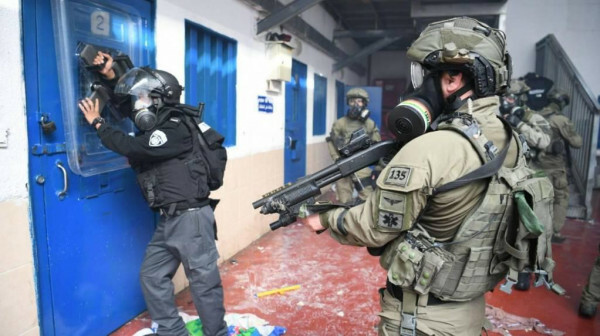 Since Sunday 20 January 2019 the prison forces along with “Massada ”special force unit raided several sections in Ofer prison. In specific, those forces raided sections 11, 15, 17, other sections in the prison were also subject to tear gas bombs. Even the minor’s section was not left in peace since those forces stood in front of their sections and rooms with their weapons and dogs terrorizing them and causing severe fear. The last raid that reported to Addameer happened on Tuesday 22 January 2019, and it targeted several rooms in section 15. The most intense raids were in sections 11, 15, 17 the practices used in those raids included tear gas bombs, sound bombs, strip-searches, harsh beating with a bag filled with metal balls, and what is assumed to be rubber bullets. In addition to this, the special forces damaged almost all of the prisoners' belongings in those sections including personal belongings and good bought from the prisoner’s canteen. We were also informed that there are a number of injuries that were not attended to this moment, those injuries include broken arms. Prisoners are protesting the systematic policy of collective punishment that comes in fact with excessive use of force. Thus, all of the Ofer prisoners are returning their meals since Monday, 21 January 2019. The Israeli Prison Services allowed all the sections yesterday, 23 January 2019 to go out in their recreational time after putting them on closure for three days. Though sections 11 and 15 were not included, as a result, all of the Ofer prisoners are refusing to go out during their recreational time. The prisoners said they will continue returning the meals and they will not go to their recreational time until all of the injured prisoners are tended and the punitive measures against all prisoners stop. The prisoners are also requesting to ban the Massada special force unit from raiding their prison again. Addameer calls on the ICRC to act upon its responsibilities and obligations towards Palestinian prisoners and investigate those gross violations and provide protection to all Palestinian prisoners. We also call on the international community and third state parties to pressure the Israeli occupation forces to uphold their obligations according to international humanitarian law and international human rights law.